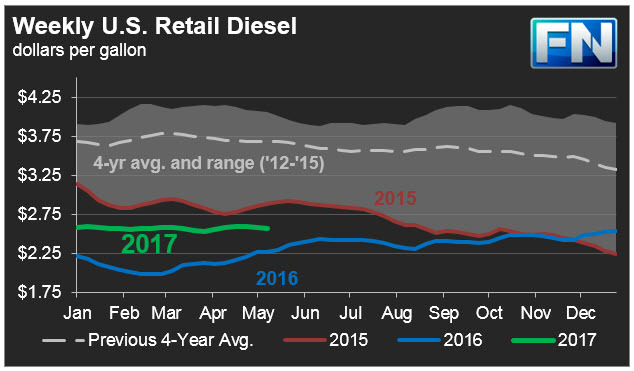 The Energy Information Administration (EIA) released its weekly data on diesel and gasoline retail prices for the week ended May 8th, 2017. Prices for both fuels declined significantly, following the downward trend in crude prices. For the current week ended May 8th, diesel prices declined by 1.8 cents to an average price of $2.565/gallon. PADD 1 retail diesel prices decreased by 1.2 cents to $2.612/gallon. New England prices fell by 1.1 cents to $2.642/gallon. Central Atlantic diesel prices fell by 2.0 cents to average $2.753/gallon. Lower Atlantic prices decreased by 0.6 cents to average $2.507/gallon. PADD 1 prices were 30.3 cents/gallon above their prices for the same week last year. PBF Energy will be shutting a 46 kbpd diesel hydrotreater at its 160 kbpd Paulsboro, New Jersey, refinery, for a three- to four-week maintenance period. In the Midwest PADD 2 market, retail diesel prices declined by 1.9 cents to average $2.497/gallon. This price was 25.6 cents/gallon above its level for the same week last year. BP will close its 55 kbpd diesel hydrotreater at its 413.5 kbpd Whiting, Indiana, refinery during the first half of May for planned maintenance. BP Husky reduced crude runs at its 160 kbpd Toledo, Ohio, refinery after its 25 kbpd coker broke down. In the Gulf Coast PADD 3, retail diesel prices dropped by 2.5 cents to $2.410/gallon. This price was 27.9 cents higher than in the previous year. Motiva was forced to reduce utilization rates at the 105 kbpd hydrocracker at its 610 kbpd Port Arthur, Texas, refinery. Motiva also was forced to shut its 60 Kbpd diesel hydrotreater. Motiva continues to work on repairing the H-Oil unit at its 230 kbpd Convent, Louisiana, refinery. Reports indicate that some of the piping infrastructure will need replacement, a process that may take two to three months. In July, Valero plans to shut down the 55 kbpd ULSD hydrotreater at its 293 kbpd Corpus Christi, Texas, refinery for an overhaul. ExxonMobil is facing delays restarting the 105 kbpd crude unit at its 503 kbpd Baton Rouge, Louisiana, refinery. The unit shut down April 24 for maintenance and the restart is now moved back from May 4th to May 14th. In the Rocky Mountains PADD 4 market, retail diesel prices fell by 1.5 cents to $2.651/gallon. This price was 37.4 cents higher than in the prior year. In the West Coast PADD 5 market, diesel prices at the pump fell by 1.8 cents to average $2.846/gallon. This price was 35.3 cents above its level last year. Prices excluding California decreased by 2.8 cents to $2.747/gallon, which was 37.9 cents above the retail price for the same week last year. California diesel prices decreased by 1.0 cents to an average price of $2.927/gallon, 33.3 cents higher than last year’s price. Valero was forced to shut down the 34 kbpd hydrocracker at its 145 kbpd refinery at Benicia, California for unplanned repairs, which extended beyond original estimates. BP shut the 65 kbpd hydrocracker at its 225 kbpd Cherry Point, Washington, refinery for an overhaul. Phillips 66 is preparing to restart the VGO/diesel hydrotreater, a sulfur recovery unit, and a hydrogen plant at its 139 kbpd Carson, California, refinery after completing an extended overhaul. 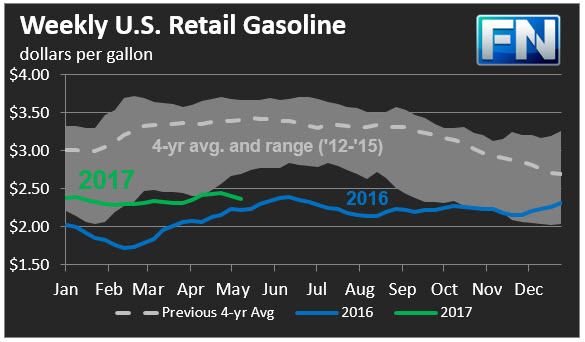 US retail gasoline prices dropped significantly by 3.9 cents for the week ended May 8th, to $2.372/gallon. This price was 15.2 cents higher than for the same week in 2016. Gasoline prices had been rising until the past two weeks brought a 7.7 cents drop. In the East Coast PADD 1, prices for gasoline fell by 3.9 cents to $2.348/gallon. This price was 13.1 cents higher than last year’s price. Prices dropped by 1.9 cents in New England to $2.384/gallon. Central Atlantic market prices decreased by 3.6 cents to $2.460/gallon. Prices in the Lower Atlantic market dropped significantly by 4.7 cents, to bring prices to an average of $2.253/gallon, which was 9.8 cents higher than last year’s average price. PBF Energy began to restart the 82 kbpd cat cracker at its 182.2 kbpd Delaware City refinery. In the Midwest PADD 2 market, retail gasoline prices dropped sharply by 5.8 cents to average $2.232/gallon. Gasoline pump prices were 11.6 cents higher than they were one year ago. Phillips 66 closed for unplanned repairs the smaller of its cokers, 20 kbpd, at its 314 kbpd Wood River, Illinois, refinery. In the Gulf Coast PADD 3 market, gasoline prices fell by 2.8 cents to average $2.168/gallon. Prices for the week were 18.1 cents higher than for the same week in 2016. Motiva continues to have issues repairing the H-Oil unit at its 230 kbpd Convent, Louisiana, refinery. Placid Refining reduced crude runs and moved up a five-week overhaul of the 25 kbpd cat cracker and related operations at its 75 kbpd Port Allen, Louisiana, refinery. Phillips 66 suffered a breakdown at the lone, 105 kbpd cat cracker at its 247 kbpd Belle Chasse, La., refinery. Valero continued to work on restarting the 75 kbpd cat cracker at its Port Arthur, Texas, refinery following repairs. In the Rocky Mountains PADD 4 region, gasoline prices decreased 1.1 cents to average $2.393/gallon. This price was 17.9 cents higher than at the same time in 2016. In the West Coast PADD 5 market, retail gasoline prices declined by 1.6 cents to an average price of $2.863/gallon. This was 22.9 cents higher than at the same time a year ago. Excluding California, prices decreased by 1.7 cents to an average of $2.651/gallon. This was 27.8 cents higher than at the same time in 2016. In California, prices fell by 1.6 cents to an average pump price of $2.986/gallon. Prior to this, California had been the only state market to have gasoline prices above $3/gallon. Prices were 20.0 cents higher than last year’s price for the same week. Los Angeles prices declined by 0.9 cents to average $3.021/gallon. San Francisco pump prices fell by 1.4 cents to average $3.041/gallon, 18.8 cents above last year’s price. Seattle prices fell 1.4 cents to average $2.873/gallon, 39.8 cents higher than prices one year ago. Chevron’s 49 kbpd cat reformer at its 273 kbpd El Segundo, California, refinery was out for unplanned repairs. Valero was forced to close its 145 kbpd Benicia, California, refinery, after a full-plant power failure on Friday. The restart is expected to take a full week. Valero was fined for flaring emissions, which caused local authorities to launch an evacuation of the area.